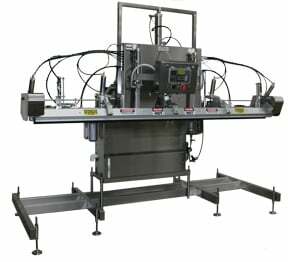 The CVP® A-200 Bin Machine line brings the advantages of Modified Atmosphere Packaging to large and bulk items. Full pallets and bins can now be processed efficiently. Wrinkle free seals are achieved with seal bars up to 100 inches (2540mm) and automatic bag stretchers or clamps. Floating head prevents bag pullout. Reproducible Results - All manifold sizes equipped with positive vacuum gas seal design to prevent snorkel leak back. PLC controls for multiple cycles and consistently low residual O2. Built-in multiple cycles for custom applications. Self contained vacuum pump. Seal Integrity - Digital temperature controls with chisel point seal bar. Standard bag stretchers eliminate wrinkles ensuring consistent seals. Impulse wire seals and hot bar sealing systems available. Flexibility - Specific option packages for all food and industrial products. Gas accumulator tank sized to packaging requirements, dwell time frequency for product respiration, floating machine head for random product fill levels or box sizes. Custom options - Sealing manifolds in 100" (2540mm), 70" (1778mm) and 57" (1448mm) lengths. Vacuum pump and filters for powders, liquids, marinades and bins. Embossing date coders.